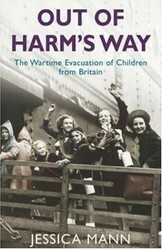 This book describes the evacuation of children to overseas during the second world war and the way people dealt with it. This sensitively written book describes the experiences of mainly British children sent overseas to countries considered to be safe, such as Canada, the USA, Australia but some to other countries considered safe at the time. There was a lot of disagreement within our shores about whether or not it was right to send them. She carefully explains all the points of view at that time and gives heart rending description of parents putting children into the hands of strangers across the world so that they would be safe, with no guarantee of seeing them again. The first deals with what was happening in Britain at the time, including taking in German Jew children who were at risk. The details of the government scheme to evacuate children out of Britain and the arrangements made for travel. How the children reacted to being sent away to what seems to some an exciting adventure and others a terrifying experience. The second part of the book describes the arrival and the process of finding homes for the children. The way some children remembered a totally different culture and how well or badly they adapted to it. This also deals with the difficulty of communicating with the family back in Britain and the fears when there had been no contact for a while. The third and final part of the book deals with return journeys and reunions, years later than expected. Some returners had become accustomed to being very well fed in the USA and returned to rationing. They found they had less freedom. The younger ones did not remember their parents and found it distressing to be uprooted and sent back to people who were strangers to them. Jessica Mann shows in her book how incredibly difficult it was for many on their return. Naturally Mann gives her own point of view about how everything was organized but is grateful to be sent to a place of safety. The author was herself evacuated at a very early age and has totally blotted out the memories of that time. She discovers this is unusual as she interviews a lot of other people about their experiences. Many were aware of the divided opinions about sending their children away to safety. Some thought it was defeatist and wrong. Good descriptions are given about the different politicians opinions on the matter. Conditions on board ship have been painstakingly researched and described in detail.Children had exchanged their gas masks for lifebelts which were kept with them all the time Although the conditions were basic most seem to have enjoyed themselves on the way out, not realising they may be going to be split up from siblings and friends on arrival. . There were restrictions from some of the host countries, the children must be in good health and very few Jewish ones would be accommodated. Many British children had not had injections to prevent smallpox and TB so were lined up for injections on arrival. British children had to say the american pledge of allegiance Many describe feeling guilty as they were much more well-off over there. It is made clear that most host families were wonderful people, struggling financially sometimes depending on where they lived but the checks were not as stringent as they would be today and a few people who were not suitable to take children in slipped through the net. This book is very well worth reading and has inspired me to read a lot more about this part of history. This sounds so interesting and the type of book I'd enjoy reading. A book review policy is important for all book bloggers to have. This article will help you to create your written policy for your blog. Suspense book on crime, adventure, murder, justice, sea, sailing, yachting, guernsey, channel islands,crime and punishment, adventure thrillers, sea adventure, sailing and the law. Are you looking for a great picture book? These are my personal favorites, complete with book reviews. I hope you love these books as much as my children and I do!